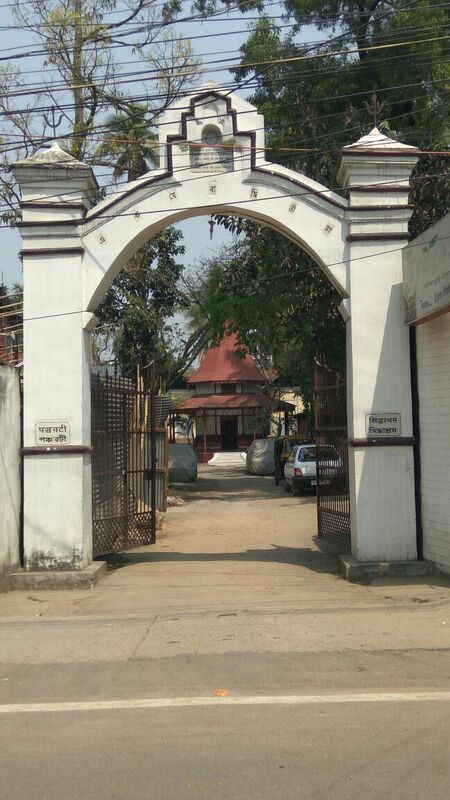 A desperate cry for help, recounting the past glory and the present crisis facing Panchabati Ashram in Guwahati where I grew up, with the hope that someone reading this will come forward to help and together we shall be able to rescue the precious Ashram and revive it in a new form and function. Today Panchabati Ashram or more precisely Panchabati Siddhashram is a pale shadow of its glorious past. 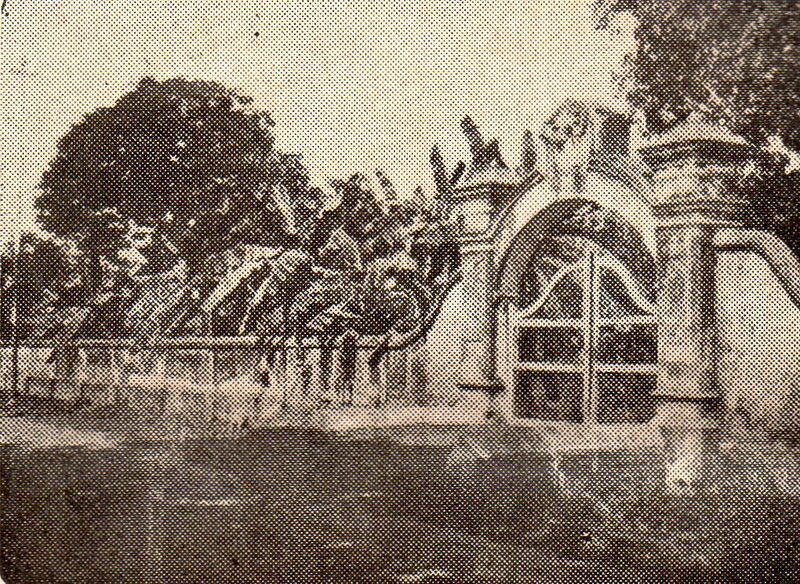 The only visible remains are the still impressive gate and a stately but forlorn temple. The name Panchabati is used these days more to refer to the area rather than in the context of the Ashram, that too by only a few dying breed of old time Guwahatians. Located as it is along one of the busiest thoroughfares of the city, plump in between Guwahati Club and Silpukhuri, it is hard to imagine today how it must have been a hundred years ago in the area in and around the Ashram. Now it is right in the middle of the city, but way back then, my father used to say that it was really very far out from the centre; there were days when tigers were seen roaming about the main road; and the only other building that existed even beyond the Ashram was the Assam Tribune building, another few hundred metres further on. Even when I was a child there was a dense jungle beyond the temple and the Ashram house. Come Phakuwa and we would happily climb the palash tree to pluck the flowers to make coloured water to splash on one another. There was a shortcut through the trees onto the Chenikuthi road from where one could reach St. Mary’s school very quickly. But I was strongly forbidden to use it because of the animals and snakes that could be lurking there… we used to live in the Assam Type house then… there were not many houses or people around us… it was mostly trees and plants. The mandir and the Ashram house remained largely closed and empty all through my childhood – the mandir was bare and I don’t remember anything much happening there as a little child. There was a massive ahot gos in front of our gate where I was told several biras lived. Just behind the tree was the Radha-Krishna temple which was part of the house where my best friend Era lived. And there was a narrow gap there on the side of the temple through which the two of us came and went many times every day. (Of course it was easier for Era to do so, as I was more than twice her size then.) There were two silikha trees on either side of the road leading to the temple and a very fragrant Champa just beyond our rear boundary on the side of the temple. There were many monkeys and birds in the Ashram and since I was terribly naughty, I was warned not to tease the apes. I can still remember the howl of foxes at night as I worried about their coming into our bedroom and eating us all up. As I grew older I learnt that the Ashram was established by my father’s moha, Jogeswar Kataki, who had come to work in the Deputy Commissioner’s office at Guwahati, in the last decades of the 19th century. Guwahati was then fast becoming an administrative centre of the British. His religious awakening however, had begun much earlier, perhaps at the time when he lost his first wife. He then married my father’s mahi, Hirabati Devi, daughter of Padmavati Devi Phukanani and granddaughter of renowned Ananda Ram Dhekial Phukan of Nagaon. Possibly Jogeswar Kataki and Hirabati Devi never consummated their marriage and the couple remained childless. Though he was diligent in his work and rose to become the head clerk, Kataki’s religious fervour became stronger day by day. In the beginning of the last century around the year 1900, Jogeswar Kataki took the decision to purchase a plot of land measuring more than six bighas from his brother-in- law and establish an Ashram there. It is hard to reconstruct how the place must have looked like then – I can only imagine it as a sprawling verdant paradise in the eastern woody fringes of Guwahati – a veritable ashram. Within a few years, realizing that he was unable to reconcile his ever increasing religious duties with his temporal responsibilities as a high Government official, he took premature retirement and became a full time Sanyasi calling himself Swami Sureshananda. Swamiji ran the Ashram with his pension. I do not know much about what he preached and practiced in the Ashram. As his fame as a mystic spread, so did his disciples. One of his disciples, Surendranath Mitra from Calcutta, planted the five different trees Ashok, Bot, Ahot, Bel, and Silikha that gave the name Panchabati to the Ashram. 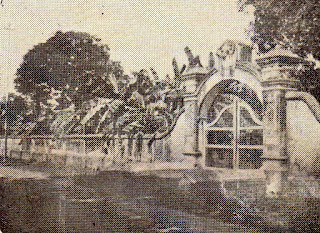 Mr. Mitra also constructed the beautiful temple and the boundary wall which at that time extended all the way to today’s Principal J. Barua Road, Chenikuthi. But Mr. Mitra was not the only Bengali disciple of Swamiji. In fact, Swamiji attracted a large number of Bengali devotees from very affluent and high ranking government officials from Calcutta, present day Bangladesh and Assam. The Assamese disciples were no less influential. 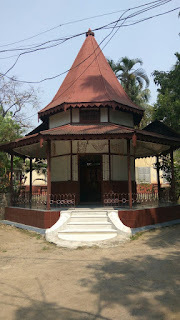 Rai Bahadur Durgeswar Sarma, Radhanath Phukan, Tarun Sarma, Kamakhya Sarma, Suren Barua were among the many Assamese families who regularly came to Panchabati Siddhashram. It is perhaps somewhat unbelievable in our fractured world of today but not surprising in yesterday’s humane world that Swamiji’s philosophy attracted devotees amongst both the Assamese and the Bengalis from here within and from far away. 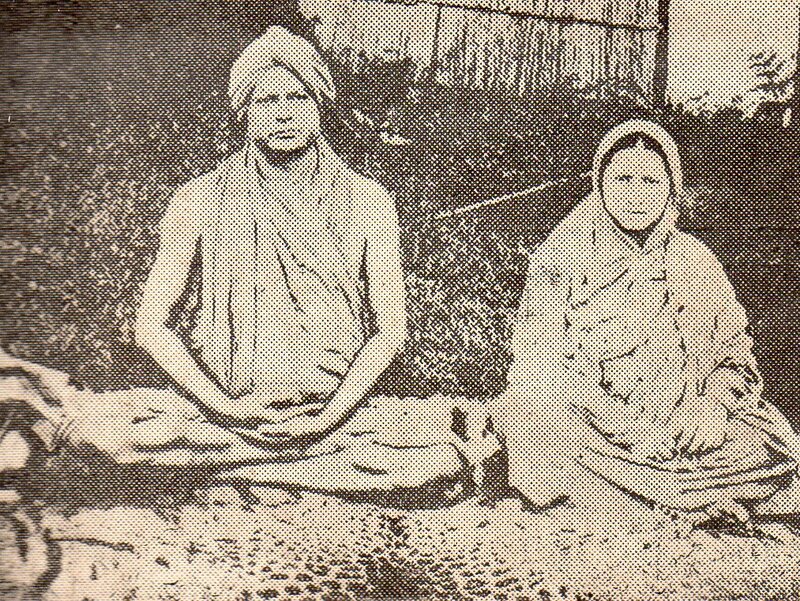 Swamiji died in 1925 and since his followers believed Swamiji to have achieved moksha or release at death Panchabati Ashram came to be known as Panchabati Siddhashram. Such was the standing of Panchabati Siddhashram then that Assam’s first Chief Minister, Gopinath Bordoloi and other eminent persons such as Kamakhya Ram Barua and Tarun Ram Phukan established a Trust to keep the Ashram going. Swamiji’s wife, Hirabati Devi, also reverentially referred to as Mataji by some, who was also very philosophically inclined, tried to keep the Ashram going as long as she was around with the help of a handful of disciples that still remained. At that time, there were a number of rooms built like a barrack along one side of the Ashram House where some young men lived on rent. Hirabati Devi had a servant boy called Amrit who was in charge of collecting rent from the bachelors living in the Ashram. By the time Mataji died in the 1960s, the Ashram had shrunk -- land was being chipped away at the edges, Mataji had sold some parts of the Ashram, other parts she had allowed disciples to build small homes to live in. My father came to live in the Ashram as a young man while he was still doing his IA, already in 1935. Mataji was his mahi and when he came to Guwahati he started to live in one of the front rooms of the Ashram house. He continued to live in the Ashram for most of the rest of his life, but when Baba got married, it was no longer possible for him to continue to stay in that house as a married couple with his wife. So Mataji gave them a plot of land where they built the Assam Type house where I spent my childhood. Baba formally took over the responsibility of the maintenance of the Ashram at some point. But Baba was no Swamiji, nor was he worldly-wise; he did not try to do more than just maintain the property, doing essential repairs, paying taxes and bills. He kept meticulous records of all the income and expenditure as long as he was in charge. He was still formally a Trustee but it is not clear whether the Trust was still functional then. The Ashram house was rented out to an office for a few years at some point but the mandir remained largely unused. Over time, the mandir had become a meeting point of an assorted medley of people – tantrics, drug addicts, or plain drunkards and alcoholics. To stop that, sometime in the 1980s, it was decided to install a Shiva linga in the mandir, and the Shiva temple is functional till today. My mother, who was instrumental in setting up the Shiva temple, went to bathe the linga every morning she was in town, for the rest of her life. She took over the maintenance of the Ashram after Baba passed away in 1993. Every now and again she would tell me amusing stories about the servant boy Amrit as well as of her interactions with Hirabati Devi after she came to live in the Ashram, and about what ‘ashramor mahi’ wanted her to do in the Ashram after her death. By then the Ashram land that remained unoccupied had shrunk even more – from more than six bighas to less than half of that size. More people had come to live there. Those who were already there had built bigger and better houses occupying more and more land belonging to the Ashram. The original Trust had become defunct by then. The land was still in the name of Hirabati Devi and there was no one who had the legal authority to stop further encroachment. Nor was there anyone to pay rent to; nor was there anyone with whom one could renew the leases that had long expired. My mother continued to pay the land tax and other bills as well as see to the day-to-day maintenance to the Ashram property. Ma never asked anyone to pay for anything, perhaps that was part of the problem, but whatever she wanted to do – be it repairing the house or painting the temple or the gate, she was always met with resistance from some of the other Ashram residents. So much so, that it has not been possible to use for any public purpose – leave alone rent out -- the Ashram house in the last twenty years or so. A few years ago Ma had invited a Senior Citizens group to hold their monthly meetings in one of the rooms of the Ashram house. Hardly had they assembled for their first meeting there that one of our neighbours barged in and started insulting them in shrill tones and using such foul language, that they decided to leave, accusing my mother of having invited them only to insult them. Ma did not try again. Ma defied everybody once to get the temple renovated once a few years back – that temple which meant so much to her, but had to digest a lot of foul abuse for having done so. Realising that probably it was her doing things on her own that they resented, Ma tried to call meetings to form committees and make plans, trying to be democratic, but could not get the others to join hands with her. As she grew older, she also began to feel helpless and also desperate. Once last year when I was home, she asked me to go and stop one of the residents from cutting down a tree – the last of the original five trees left in the Ashram. When I told her there was no point in that as I would not be able to stop the tree-cutting, she told me to get a letter written with which she could go to meet the DC the next day and request the government to take over the Ashram property and use it for some public purpose. We went to meet the DC the following day. She tried to explain her fears to him. Before he took any action, Ma passed away. Going through her papers, I have found her writing in many places, asking me to take good care of the Ashram, to keep the buildings in good repair, and to make sure that pooja is offered daily in the Shiva temple. Ma also wrote that she felt she was just a caretaker of the Ashram property, and that I should treat it the same way, and make sure that the Ashram continues to exist, forever. I have grown up in the Ashram, spent the better part of my childhood there, was married off from there, I also have no other wish but to ensure that the Ashram not only continues to exist but flourishes for all time to come. But how does one ensure that? I have tried to talk to all the other Ashram residents to try to find a way forward. But not everyone wants to talk. There are some who are interested but they are also busy with their own lives, do not have a lot of time to spare for the Ashram. I have been trying these last months to form a Committee to oversee the everyday running of the Ashram – even that seems to be a next-to-impossible task. Some of us have tried approaching the government, but perhaps nothing will come out of it – first they have no time as they are busy organizing festivals and updating NRC, and by the time they eventually find the time, the officers who had initiated the move have already been transferred. The bottom line is – they don’t really care what becomes of the Ashram… it is not their problem. But it is mine, and I do care. The Ashram means a lot to me. It is a responsibility that I would like to fulfill. Today, besides the Shiva temple and the Ashram House, there is only a square plot in one back corner with a pond in the middle. Of the many trees that I remember from my childhood, there are none left now… trees have been replaced by houses and people… Our favourite hide-outs in the dense undergrowth have long been discovered and flattened out. I am sure no animals come there anymore, besides the stray dogs and cats that live anywhere in a crowded city. Era’s mother kept cows she would lead and leave to graze in the Ashram most days. That is a distinct memory from my childhood. Things were so much easier when I was younger. I don’t remember having any problems going into any of our neighbours’ homes then, asking for food, playing with the pets, curling up in their beds under a warm lep. We used to play phakuwa together, enact one-act plays in our garage and generally romp around like tomboys with the younger ones in tow with not a care in the world. Today Era no longer lives in Panchabati. There is still a cow in the Ashram – that and the pond with the few trees around it still brings back old memories whenever I go to the part of the Ashram behind the Shiva temple. Which is not often, because first I do not live in Guwahati permanently anymore and second, because I do not like the hostile way some of my neighbours behave when they see me there. Is this what it has come to? The physical skeleton of the Ashram is still there, but the soul has long been eaten away by termites that feed on greed, jealousy, fear and mistrust. Is this what an Ashram is supposed to mean? Even otherwise, I feel that the Panchabati Siddhashram, established more than a century ago, is an important part of the cultural and religious heritage of our city and of our state. We should do something in the Ashram that will carry forward Swamiji’s legacy in a meaningful and constructive manner, for the wider good of the people, for all time to come. All suggestions and offers to help are welcome in order to realize some of the many dreams at least, so that the Ashram (or the precious little that is left of it) lives on forever, and what is more, that it regains some of its earlier dignity and serenity, where people come to find peace and quiet and a whiff of nature if nothing else, in the middle of this mad loud crowded frantic city.